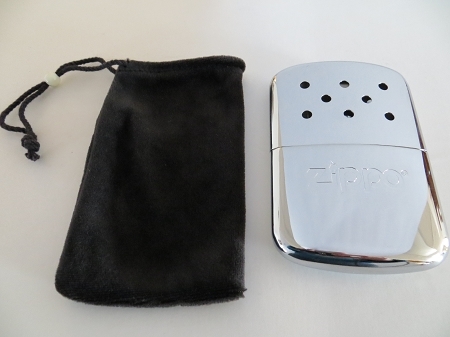 This Zippo Hand Warmer is a compact design and fits comfortably into pockets or gloves. Produces constant warmth for up to 12 hours with just 0.4 ounces of fuel (not included) The burner offers quick and sure lighting and produces radiant heat without open flame. High polished chrome and velour bag is included. Perfect for outdoor winter sports: ice fishing, hunting, disc golfing, dog walking, running. Measures 2.625" wide by 3.93" tall by .5" deep. Price includes engraving.